All over the world and throughout history, children have often dutifully followed in their forebears’ footsteps when it came to choosing a career. In my own case, I’ve stubbornly followed my own inner drummer to forge a career path that is singularly mine. That path has gone in several directions over the years but has of late come full circle. I was a professional writer and editor in New York City for many years. More recently, I taught English and Creative Nonfiction Writing at UNM in Taos, as well as Creative Nonfiction Workshops through SOMOS (The Society of the Muse of the Southwest) in Taos. I was also a caterer, chef, and food writer in New York for ten years; and I taught in the Culinary Arts department at UNM-Taos for several years. In addition, I wrote a monthly food column for The Taos News for two years. 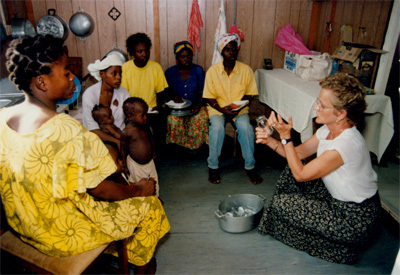 I taught patchwork quilting as an independent economic development project in Segou, Mali, West Africa, for nearly three years, then tried my hand at making art quilts for a living when I first settled in northern New Mexico in 2001. All of these experiences are worth sharing, I believe, which is why I write and teach. 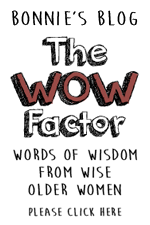 As an educator, I feel it is my purpose, now that I am an elder, to share what I’ve learned along the way. The photograph of Hemingway’s stairs that you see on each page of this website (see credits page) is a visual depiction of my teaching philosophy: Life is a climb. Take it one step at a time. Yes, you can do it! The view only gets bigger and better the higher you go. 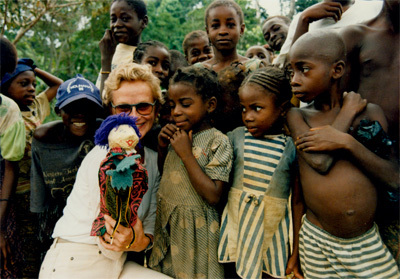 (Above, left:) Puppet Chantal Chanson taught the children of Mana-Mana, Gabon, the importance of hand-washing for health.